Kevin has competed at the national level in both endurance and strength sports. In 2009 he was a member of Team Alberta Rowing at the Canada Games, and in 2012 was the national champion in his category at the Canadian Powerlifting Union (CPU) Championships. 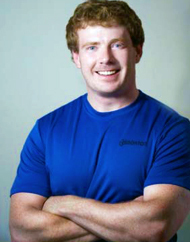 Kevin has worked as a trainer with the City of Edmonton since 2010 and enjoys working with clients whose goals include improving athletic performance, injury rehabilitation, weight loss, as well as improving general health and wellness. Kevin has gained valuable knowledge and experience through the completion of his university practicum with the Physical Rehabilitation Clinic at the Edmonton Garrison helping to rehabilitate members of the Canadian Armed Forces as well as working with athletes coaching the University of Alberta Rowing team. Training isn’t easy, but that doesn’t mean it needs to be complicated. Leave the gimmicks and fads to late night television and focus on simple hard work done right for best results.